Everybody’s talking about Max Baucus’ plan for health care! Mostly, people don’t like it! • The bill spends too little on coverage subsidies. While putting a price tag on something that is paid for inside the budget window is misleading, the fact is that Baucus artificially lowered that price tag to meet some conception of centrism, and the lowered subsidies have a direct impact on affordability. People in Massaschusetts are by and large satisfied with the Connector. It’s toughest on the fairly small number of families earning just over 300% of FPL (of which there aren’t that many), and on the larger number of young individuals who make just over 300% of FPL (which is $32,320 for an individual, so there are a decent number of those folks). Working class families earning up to 200% of FPL have fairly low premiums. $90 per month is going to pinch, but for uninsured households, they’ll get some real value out of that: Commonwealth Care plans include dental insurance, wellness checkups have low co-payments; chronic disease care is especially well covered, and so forth. Likewise, three hundred pre-tax dollars a month for a family with a gross income of $60,000 per year is Real Money, but it’s not going to break the bank. It’s less than what they should be saving for college, for instance. 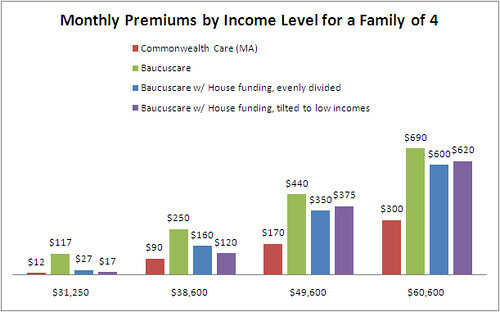 But as you can see from the graph, the Baucus bill doesn’t fare as well. It’s not even close to faring as well. The eight million individuals without insurance who earn between 200% and 300% of FPL will pay more than twice what similar households in Massachusetts currently pay. And working class families will feel a real pinch; $250 per month ($3,000 per year) for a family of four with an income of $38,000 is going to hurt. • The community rating provision, mandating that insurers offer the same price to everyone regardless of medical history, comes with a tremendous loophole that will allow them to change five times as much for a policy based on age, which is just another way to discriminate against the sick. • The excise tax for violating the individual mandate could cost up to $3,800 but wouldn’t kick in if the individual could not find coverage that costs more than 10% of his income. In which case, you’ve built a robust architecture for a useless plan, because if millions opt out the coverage gets less universal and insurers want to stop come-as-you-are guaranteed issue. of the garbage insurance that giant employer – let’s call them Ball Bart – might offer you. The co-ops can only compete in the small group and individual markets. That is to say, if the co-ops prove effective, and The Washington Post would like to offer co-op coverage as an option to its workers, it can’t. The co-ops are not allowed to contract with large employers, which is to say, they can’t compete with private insurers in the largest market, and they can’t get the purchasing power that would come from a serious foothold among corporate customers. Not only is their size restricted, so too is what they can do with their size. The co-ops can band together to increase their purchasing power, but they can’t set national payment rates for their members, a la Medicare. As I understand it, they have to bargain with each provider and drug manufacturer and hospital and so forth separately, meaning they’re denied one of the main advantages of size. The insurance industry is, in other words, being protected from not just public competition, but co-op competition. Marcy Wheeler has a lot more. There’s one promising sign that the exchanges look expandable and available to all businesses, a neat way to gradually wean the system off of exclusive employer-based insurance, but that’s about the only silver lining. Kent Conrad’s gambit of increasing the budget window to make the Senate Finance bill look better did work, as the deficit reduction aspects look improved for the bill over the House bill. But crucially, that’s a function of the funding, not the outlay in subsidies. Those will be too stingy to make the bill work for people, only for the bean-counters. In fact, the bill will start taking more and more from the middle class, much like the alternative minimum tax, and political reality will force scalebacks, so the budget picture doesn’t look as rosy as advertised. But it also suggests some real dangers in the bill’s second decade. The unpopular elements of the bill become a lot bigger and more onerous. The excise tax on high-cost insurance plans begins affecting insurance plans that aren’t particularly high-cost. The Medicare and Medicaid savings begin to tighten. That said, there are a lot of potential savings that the CBO isn’t taking into account here, so that might ease the pain. Plus, at some point, we are going to have to start cutting costs in the system, and you can’t escape some eventual hurt in that. But you can be sure the GOP is going to run these numbers aggressively and spin them viciously. The good news is that this is in no way “the bill” that will get signed by the President. It has to go through a significant amount of changes, and key Democrats are already balking at it. In fact, lil’ ol’ Roland Burris said he wouldn’t vote for anything without a public option, and with the numbers so tight, every Senator is in a bargaining position. Baucuscare is an abomination. But it doesn’t have to be the endpoint, only the beginning. I should say that one group really, really likes the Baucus bill – insurance companies.